Every city has its own iconic food experiences. Like Philadelphia’s cheesesteak, San Francisco’s sour dough bread, and Chicago’s deep-dish pizza, Brooklyn offers its own food specialties, all of which spring from its fascinating multi-cultural history. 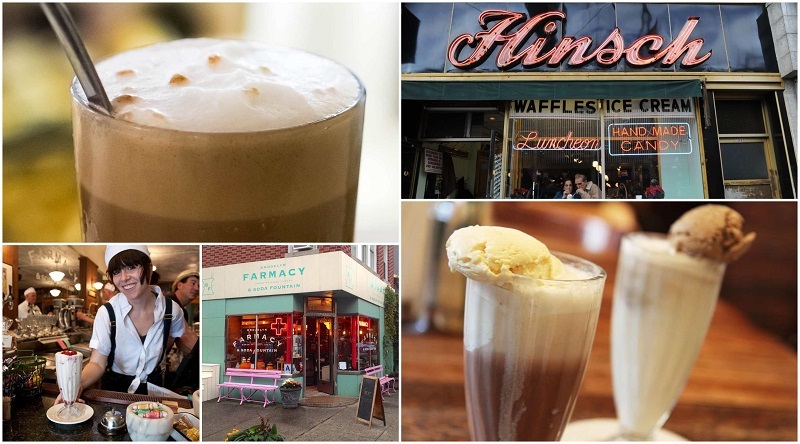 Whet your appetite: Here are the 10 best food options you must try when you visit Brooklyn! If you thought authentic, delicious pizza could only be found in Italy, think again. Although traditional New York pizza is cheesier, slightly sweeter and definitely larger than its Italian ancestor, New Yorkers are just as passionate about what constitutes ‘the best’ pie as the Italians. And although New Yorkers will argue about pretty much anything, it is generally agreed upon that Brooklyn has the tastiest and most varied pizza joints in New York. 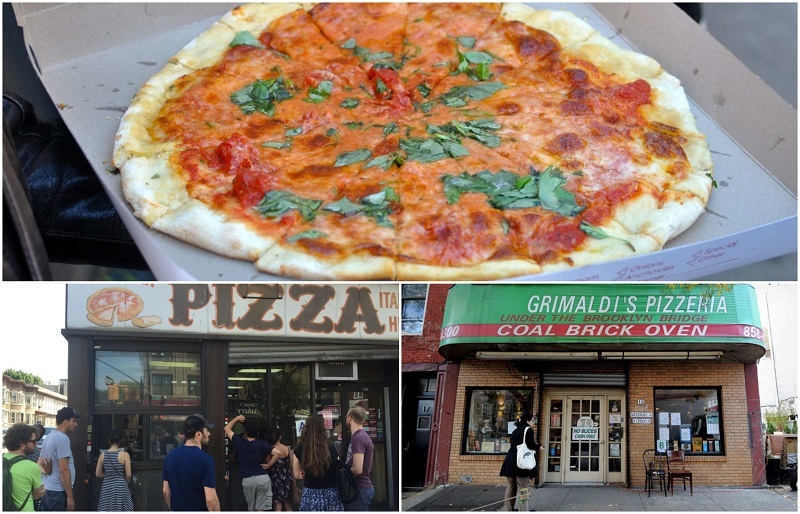 Grimaldi’s Pizza – For the most famous slices, try Grimaldi’s Pizza—one of the oldest pizza places in Brooklyn. You might have to battle a line around the block at its location under the Brooklyn Bridge, but it will all be worth it once you taste their traditional crispy crusted, coal-fired pizza. Di Fara Pizza – Equally famous is Di Fara Pizza in Midwood, where you’ll probably also have to wait an hour or more for a taste of its famous New York style pizza, made by a native Napoli who uses only ingredients from Italy. If it wasn’t so good, there wouldn’t be a line! Get a private guide who will drive you around in a vintage taxi cab, showing you up to 6 different popular Pizza restaurants. Get a free slice of pizza at each venue and learn about the different types of pizzas available in Brooklyn. There are many stories surrounding the invention of this American classic hot dog, which is an adaptation of the German Sausage. The city of origin (Chicago, St. Louis, or New York) isn’t agreed upon, but what is known is that in 1916, a Polish immigrant named Nathan Handwerker opened his own hotdog stand in Coney Island, Brooklyn, and sold hotdogs for 5 cents a piece. Nathan’s Famous – Almost 100 years later, Handwerker’s stand has become a company called Nathan’s Famous with franchises nation-wide. But the original Nathan’s still operates in Coney Island and delivers the same authentic and delicious beef wiener topped with mustard, ketchup and sauerkraut. When you visit Nathan’s, be sure take a ride on some of Coney Island’s creaky, old-school roller coasters, but make sure you do so before stuffing yourself with hotdogs! Brunch is a huge cultural phenomenon in New York City that pretty much everyone, from locals to tourists, enjoys between the hours of 10am and 12pm on the weekend. Why this in-between breakfast and lunch meal is so well loved in the city is unknown, but it might have something to do with having a classy excuse to drink before noon. 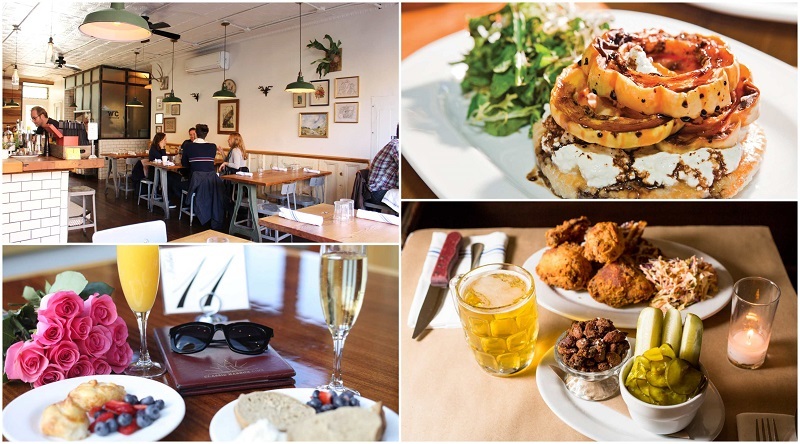 Whatever the reason, the obsession has led to the establishment of scrumptious and reasonably priced brunch options in almost every neighborhood in Brooklyn. The meal is listed at a fixed price at most places, which usually includes a main dish, coffee or tea and an alcoholic drink like a mimosa or bloody mary. Buttermilk Channel in Carroll Gardens. 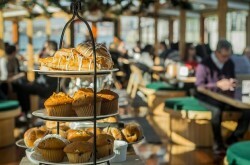 Jump on board a 1920s luxury yacht and enjoy a 4 course brunch buffet while cruising around Manhatten. You’ll also get a complimentary drink on this 2.75 hour long cruise. Like practically every other ‘classic’ New York food, the cheesecake didn’t actually originate in New York—or even in the US. But a New Yorker did change the traditional European dish into what it’s commonly thought to be today: the creamy, sweet, and dense cake that will leave you with the surprisingly pleasurable feeling of having a rock resting in the pit of your stomach. 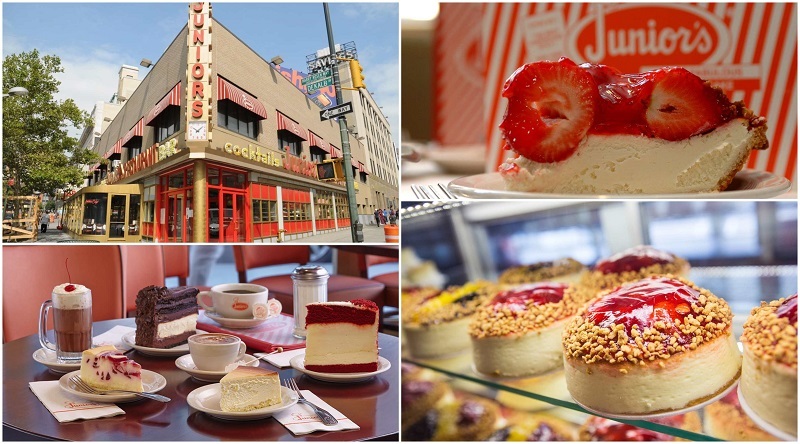 Junior’s – The most famous cheesecake in Brooklyn is Junior’s on Flatbush Avenue, which has been dominating Brooklyn’s dessert scene for over 60 years. Enjoy a slice of the creamy, tangy, cheesy goodness with a cup of their delicious coffee. Originally from Poland, this round roll with a hole in the middle made its way to Brooklyn in the 19th century, and is now one of the most popular breakfast foods in America and one of New York City’s most iconic foods. The majority of the bagels sold and consumed in the US are mass produced, dry, and tasteless, but in Brooklyn you can still find the traditional, dense, doughy bagel. Bagel Hole – For guaranteed deliciousness, try the tiny Bagel Hole in Park Slope, Brooklyn, where they hand-form, boil, and bake their own bagels fresh throughout the day—the traditional way. Enjoy your hot and chewy bagel with one of their flavored cream cheeses—scallion is excellent. What’s also called a subway, hoagie, grinder or poor boy sandwich in other parts of the US is called a ‘Hero’ in New York. This Italian-style sandwich, usually featuring cold cuts like ham, salami or prociutto with mozzarella or provologne cheese, vegetables, and oil and vinegar dressing is actually an American invention, which was popular among Italian American dock workers in the early to mid 20th century. DeFonte’s – Brooklyn’s most famous Hero Sandwich spot, DeFonte’s, got its start during WW2 by making lunch time Hero sandwiches for Brooklyn’s dock workers. As it got its start feeding these hungry men, their full sized heroes are enough to last most people three meals, making it a very tasty and satisfying bargain! The Bialys is similar to the bagel in that it’s a round, chewy roll introduced to the States by Polish immigrants. 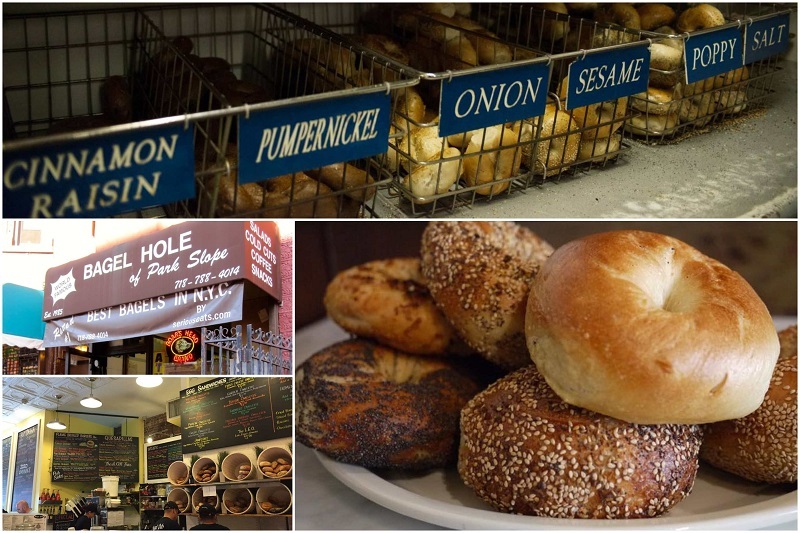 Unlike the bagel, however, it’s baked—not boiled, it does not have a hole in the middle, and it never became popular in the US anywhere outside of New York—making it one of the city’s best kept culinary secrets! Try Bagels and Bialys in Midwood, Brooklyn. What is an egg cream soda you ask? It’s an eggless, creamless, sweet, frothy combination of bubbly seltzer water, cold milk, and chocolate syrup. Although its exact origins are a mystery, we do know that it was invented over 100 years ago, and probably by mistake. In any case, it’s since become the official beverage of Brooklyn, so you can’t really visit without trying one! Brooklyn Farmacy & Soda Fountain in Cobble Hill. Jewish Delicatessens or ‘Delis’ are as connected to the fabric of New York’s history as The Statue of Liberty or Broadway. 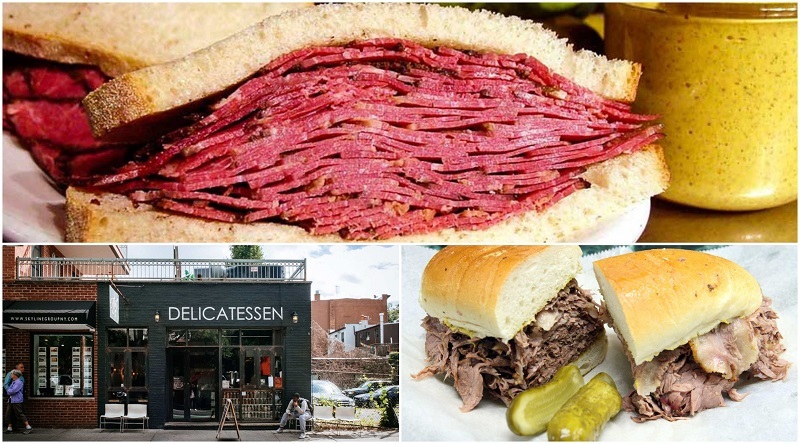 Although the heyday of these establishments’ popularity passed more than 50 years ago—at one point there were more than 5,000 Jewish delis in New York—you can still find some delicious traditional American Jewish deli fare, including pastrami on rye, matzo ball soup and lox bagels. Mill Basin Delicatessen in Mill Basin. Mile End Delicatessen in Boerum Hill. David’s Brisket House in Bed-Stuy. After trying all of these local specialties, be sure to save room for dessert! 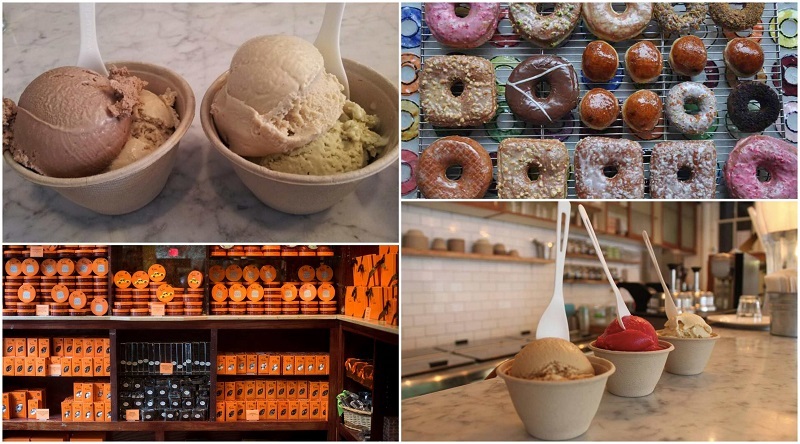 Although perhaps not as refined as nearby Manhattan’s dessert scene, if you’re craving something sweet, there are plenty of delicious and unique treats to be found in Brooklyn. Peter Pan – Stop at Peter Pan’s in Greenpoint for the classic American breakfast pastry: the doughnut. They serve the best in Brooklyn. Van Leeuwen Artisan Ice Cream – For the best ice cream, try Van Leeuwen Artisan Ice Cream near Cobble Hill, where they serve unique flavors of ice cream made from fresh hormone and antibiotic free milk and cream from local farms. Jacque Torres Chocolate – for a more sophisticated treat, visit Jacque Torres Chocolate in DUMBO—a tiny neighborhood under the Brooklyn Bridge—which sells delectable handmade artisan chocolates along with hot chocolate, ice cream, and the American classic: chocolate chip cookies. Perfect for foodies, this tour will take you to all the best restaurants and local spots in Brooklyn where you can sample all type of famous dishes including Neapolitan pizza and Jacques Torres chocolate. On this 5 hour tour you’ll also learn about the Brooklyn culture. If you find yourself wandering the streets of the Big Apple, you will notice that you are surrounded by sweet temptations. Among many other things New York has to offer, food should definitely have a higher spot on your priority list. You can buy a tasty cup of coffee and a famous bagel from street vendors and enjoy an authentic american morning routine. Brooklyn is a foodie’s paradise. Very helpful article, next time I will be in New York I will definitely try some of these suggestions. Really useful and detailed list. The last time I visited Brooklyn all I tried was the famous NY pizza from Grimaldi’s, hot dogs, coffee and bagels. With this list, I will surely try it all the next time I go to Brooklyn. Brooklyn is indeed a foodie’s paradise. I loved their pizza culture, though i want to add Juliana’s on this list. I have not heard of the egg cream soda, seems interesting. Nice article! Quite educational 🙂 especially if you want to find a little gem in a big city, especially if you are here just for couple days.